Alexander Buchan (died 17 April 1769) was the Scottish landscape artist aboard HMS Endeavour on James Cook's first voyage to the Pacific in 1768, having been appointed to the position by Joseph Banks. His best-known works are his illustrations of the people of western Tierra del Fuego, made during a stopover at the Bay of Success. Banks recorded in his journal that Buchan suffered from an epileptic seizure. He died at Matavai Bay on 17 April 1769, and was buried at sea. Following his death, Banks took possession of all his drawings. Nearly all of these are now in the British Library, except for several illustrations of south Atlantic marine life held by the Natural History Museum. All surviving works are fully catalogued in The art of Captain Cook's voyages by Rüdiger Joppien and Bernard Smith. ^ a b c d e "Buchan, Alexander (? - 1769)". South Seas Companion. National Library of Australia. Archived from the original on 24 September 2009. Retrieved 2009-09-22. This article about an artist, architect or photographer from Scotland is a stub. You can help Wikipedia by expanding it. Abel Janszoon Tasman was a Dutch seafarer, explorer, and merchant, best known for his voyages of 1642 and 1644 in the service of the Dutch East India Company (VOC). He was the first known European explorer to reach the islands of Van Diemen's Land and New Zealand, and to sight the Fiji islands. Sir Joseph Banks, 1st Baronet, was an English naturalist, botanist and patron of the natural sciences. The maritime European exploration of Australia consisted of several waves of white European seafarers that sailed the edges of the Australian continent. Dutch navigators were the first Europeans known to have explored and mapped the Australian coastline. The first documented encounter was that of Dutch navigator Willem Janszoon, in 1606. Dutch seafarers also visited the west and north coasts of the continent, as did French explorers. John Hawkesworth, English writer and book editor, was born in London. Captain Matthew Flinders was an English navigator and cartographer who led the second circumnavigation of New Holland that he would subsequently call "Australia or Terra Australis" and identified it as a continent. Abel Tasman had circumnavigated it more widely in 1642-43 and had charted its north coast in 1644. Bernard William Smith was an Australian art historian, art critic and academic, considered one of the most eminent art historians of the 20th century. His book Place, Taste and Tradition: a study of Australian art since 1788 is a key text in Australian art history, and an influence on Robert Hughes. Smith was associated with the Communist Party of Australia, and after leaving the party remained a prominent left-wing intellectual. Smith sold much of his art collection to fund one of the first art prizes for artists of Aboriginal background. 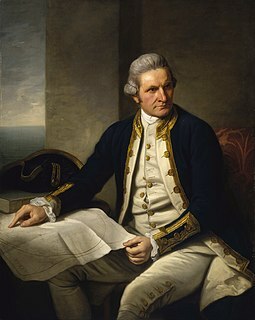 John Webber was an English artist who accompanied Captain Cook on his third Pacific expedition. He is best known for his images of Australasia, Hawaii and Alaska. The Australian Museum's Cook Collection was acquired in 1894 when it was transferred from the Government of New South Wales. At that time it consisted of 115 artifacts collected on Captain James Cook's three voyages of discovery Throughout the Pacific Ocean, during the period 1768 - 1780, along with documents and memorabilia related to these voyages. Many of the ethnographic artifacts were collected at a time of first contact between Pacific Peoples and Europeans. In 1935 most of the documents and memorabilia were transferred to the Mitchell Library in the State Library of New South Wales. The provenance of the collection shows that the objects remained in the hands of Captain James Cook's widow, Mrs Elizabeth Cook and her descendants until 1886. In this year Mr John Mackrell, the great nephew of Isaac Smith, Elizabeth Cook's cousin, organized the display of this collection at the request of the NSW Government at the Colonial and Indian Exhibition in London. In 1887 the London-based Agent-General for the New South Wales Government, Saul Samuel, bought John Mackrell's items and also acquired those items belonging to the other relatives Reverend Canon Frederick Bennett, Mrs Thomas Langton, H.M.C.Alexander and Mr William Adams. The collection remained with the Colonial Secretary of NSW until 1894, when it was transferred to the Australian Museum.